There may be nothing in this article about Oregon Duck football. This article is about a SPECIFIC 4-3 defensive system, and the Ducks will be using the 4-3 next season. But the two systems might — probably will — differ a lot. The system Brady Hoke used at Michigan — and will probably use at Oregon — is significantly different than the one I’m praising. Also, I’m not saying I’m right. Hoke certainly knows more about football than I do; I haven’t actually coached for 25 years. I also know the vast majority of you are “results-oriented.” You don’t care HOW your Ducks stop opponents — just that they STOP ‘EM. I won’t get into specific X’s and O’s — just philosophy. For many years I’ve thought there was nothing interestingly unique being done defensively in football. As a long time high school defensive coordinator, I felt sorry for current college defensive coordinators, trying to keep up with all the inventive, high-powered, no huddle, spread offenses. How do they get the defensive calls in so fast? How do they adjust properly to all the many different formations and motion? How do they get into nickel defenses when they can’t substitute [If the offensive team doesn’t substitute after a play, the defense isn’t allowed to substitute]? Pat Narduzzi has worked his magic at MSU and Pitt. In researching the different ways the 4-3 defense is used by today’s college coaches, I found the 4-3, cover 4 version taught by Pat Narduzzi, longtime defensive coordinator at Michigan State and current head coach at the University of Pittsburgh, and I fell in love. The 4-3 defensive front Michigan State, and now Pitt, uses definitely isn’t unique. I coached a similar version of the 4-3 front in 1973. The most successful use of the 4-3 was, during the ’80s, by Jimmy Johnson and Dave Wannstedt at Oklahoma State, the U. of Miami, and the Dallas Cowboys. A big part of their success was attributed to emphasizing speed over size in their front 7. Coach Narduzzi still considers that up-front speed, much more than size, is essential to successfully execute his version of the 4-3. But, over all those years, a lot of coaches have used the 4-3 front very unsuccessfully and very uninterestingly. 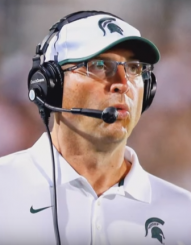 So, why am I now  fascinated with Michigan State’s version of the 4-3? I’ll start with the cover 4 as MSU uses it. Cover 4 [also known as “quarters coverage”] wasn’t used when I coached. My last year was 1991, and I used a “small part” of this coverage. Adding Narduzzi’s variation of the cover 4 was the missing ingredient. The 4-3 front by itself still isn’t special, but adding this very-well-thought-out cover 4 is like adding a great sauce to good, firm pasta. It enhances the basic stuff enough to get me fascinated and excited enough to write about it. This 4-3 isn’t just a front alignment — it’s a wonderfully thorough defensive “system.“ The football [and basketball] offenses and defenses I’ve admired over the years were always “systems,” not just unrelated and unnecessary plays. Narduzzi’s signature defense holding down Ohio State in 2013. College and high school defenses now have to be simple. I’d always used hand signals to call the defense, but our defenders got to huddle, and I only had to signal to one [smart] guy, who had plenty of time to convey my message. Now each player is expected to interpret, very quickly, via a signal what his assignment is on the next play, usually as he’s hurrying to line up for a formation the offense is in already — and then will probably shift or motion out of to another alignment. Forced simplicity cuts down on the amount of things a defense could do. But that can be a very good thing. Urban Meyer told a story about his days coaching offense at Utah. The inside-zone-read was one of his plays, but it wasn’t especially effective. Then Meyer eliminated 3 or 4 plays, and spent the time gained not practicing those plays but on more thoroughly teaching and practicing the inside-zone-read. As a result, the IZR became the best play in the Utah offense. It seemed to me that too many defensive coaches, in trying to confuse the offense, were confusing their own players. 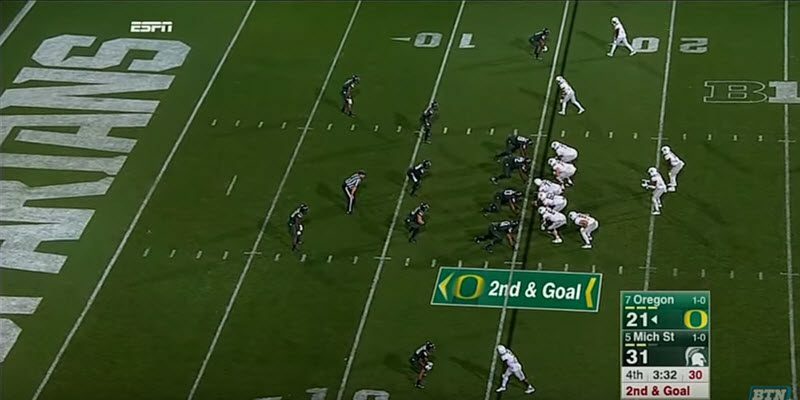 Over the recent years, in watching tapes of Oregon’s very fast tempo offense, it seemed as if almost every big play by the Ducks was because of a defensive mistake caused by confusion. Coach Narduzzi thought, “We have to keep it simple.” What if we only line up in one alignment, every play? What if our defensive players don’t have to learn a whole lot of alignments, and different techniques?” They wouldn’t confuse the offense, but more importantly, the defensive coaches wouldn’t confuse their own players. Remember, “It’s not what you do, but how you do it.” If players weren’t confused by too many different fronts, stunts, blitzes, and/or coverages, if they were thoroughly taught how to precisely execute their fundamental techniques, master the “little things” day after day after day, maybe they could play more efficiently and faster. Play faster in their reactions and play more aggressively in carrying-out their assignments. Maybe, the defensive players could/would play to the maximum of their abilities. Shouldn’t that be the primary goal of all coaches? “Simple” is a relative concept. The match-up zone techniques used in this cover 4 pass defense are extremely difficult to master. But it’s such a wonderful way to effectively play pass defense that it’s, aside from an “occasional” blitz, the only pass defense the players have to learn. There’s no way the defensive players could master the match-up zone techniques if they were asked to execute other potentially confusing, practice-time-consuming, not “needed” coverages. Narduzzi has often gone entire games using only his base 4-3, cover 4 defense. The key to the uniqueness of Narduzzi’s Cover 4 in stopping the running game is his use of the safeties. Narduzzi’s safeties are “in the box.” They never line up deeper than 10 yards, and are coached as aggressive “deep LBs” versus the running game. Usually, a “2-high” safety look means an emphasis on pass defense — not so with Narduzzi’s run-stopper safeties. They make this cover 4 into a nine-man front if the offense lines up in a basic, 2-wide receiver set. If the offense spreads out potential receivers, this defense can match up with them without removing the safeties from the box. 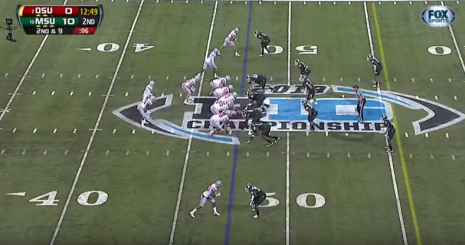 Oh, Michigan State still did a few different things — to necessarily supplement their base defense — but they lined up the same way every time: a four-man front, with three linebackers, press corners, and two deep safeties. Whether it was 1st-and-10 or 3rd-and 25, the alignment would look the same. Possible alignment confusion was eliminated. Also, just by lining up this way, it prevented the defensive coaches from getting too creative/complicated in their schemes. Just because a unique change-up scheme seems really cool in theory, it can hurt a defense more than help if it wastes valuable practice time mastering the basics and/or the defenders can’t execute that unique scheme perfectly with no confusion. Watching the videos of Michigan State play defense is a beautiful thing. I’d forgotten how truly enjoyable it is to watch a really great defense in action. And the added enhancement of having coach Narduzzi explain what his defenders were doing, and have those explanations make perfect sense, was a truly fascinating, stimulating experience for this old man. If you’re interested, Championship Productions has teaching videos available. As a Duck fan, I sure hope Brady Hoke’s defensive teams play like Pat Narduzzi’s.